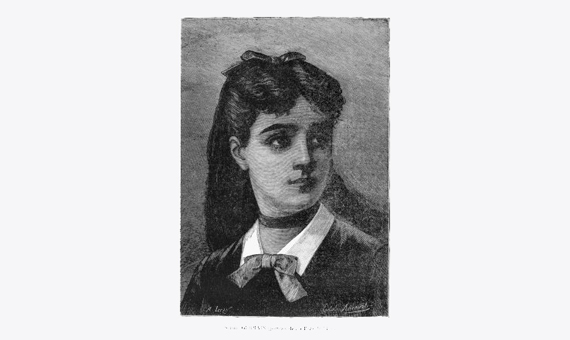 Marie-Sophie Germain was born in Paris on 1 April 1776. Her father was a merchant who was elected representative of the States-General in the Constitutional Assembly in 1789, which gave Sophie the opportunity to listen in her own home to conversations on philosophy and politics with leading figures of the day. On the outbreak of the revolution in 1789, Sophie was confined to the house for a period to avoid the upheavals outside. She spent her time devouring her father’s library and became fascinated by the death of Archimedes in one of the books she found on the history of mathematics. She then decided to devote all her efforts to mathematics, and even learned Latin and Greek so she could read the works of Isaac Newton and Leonhard Euler. Her parents did not approve of her enthusiasm and even went so far as to forbid her from lighting a fire to heat her bedroom or wearing warm clothing, in an attempt to make her stop reading. But nothing could deter the determination of the girl, who spent whole nights reading by candlelight. The École Polytechnique opened in Paris in 1794 when Sophie turned 18, and although they did not admit women, the courses could be followed from the lecture notes, and Sophie registered under a man’s name: Antoine-August Le Blanc. The students could also send observations to their teachers and it was thus that Joseph Louis Lagrange soon began to receive comments from Monsieur Le Blanc. When he realized her talent, Lagrange arranged a meeting where he discovered her identity, although he continued to support her. Sophie Germain maintained an active correspondence with renowned mathematicians such as Legendre and Gauss. She embarked on a regular correspondence with Carl Friedrich Gauss using the pseudonym M. Le Blanc, with interesting results on number theory. Her real interest in corresponding with Gauss was her fascination with Fermat’s theorem, and she subsequently published a result in a particular case that became known as Sophie Germain’s theorem. Her second important result in number theory was the demonstration that for all prime numbers n under 100 there is no solution to Fermat’s equation, when the numbers x, y, z are not divisible by n, although in fact the demonstration was also valid for prime numbers under 197. Subsequently, L.E. Dickson used Sophie Germain’s theorem to raise the limit to 1,700. 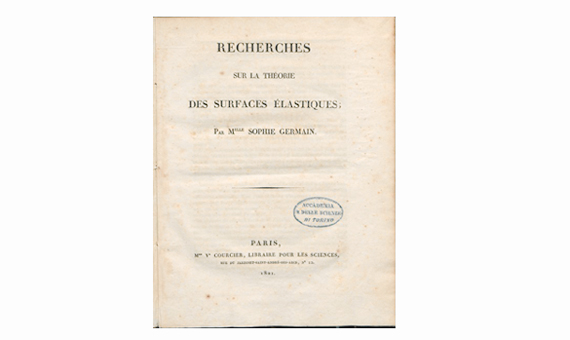 Récherches sur la théorie des surfaces élastiques, 1821. Source: BEIC Foundation. In addition to her reputation in number theory, Sophie Germain developed a preliminary work on elasticity theory. A contest sponsored by the Paris Academy of Sciences awarded the “Prix Extraordinaire” to anyone who resolved a set problem on the effects of the vibration of an elastic surface and could compare the theoretical results with the experimental evidence. This problem derived from the experiments of Ernst Florens Friedrich Chladni with vibrating metal plates. Sophie had to submit as many as three manuscripts before she was awarded the prize, although with certain caveats. This may have been the reason she never went to collect it, as she felt disparaged by many of her colleagues simply for being a woman. In this work, Sophie proposed differential equations for vibrating surfaces. The two first submissions were inconclusive, and the third finally won the prize under Lagrange’s supervision of the mathematical analysis. The main premise of this work was that “at a point on the surface the elasticity is proportional to the sum of the principal radii of curvature of a surface at that point”. The considerations of translational and rotational symmetry of the plate led Sophie to formulate a sixth order partial differential equation whose solutions were given in the form of trigonometric series. Poisson, with whom she consulted on several occasions, published his own work on elasticity without acknowledging her advice. In 1829 Sophie discovered she had breast cancer but continued working despite the pain until her death on 27 June 1831, at her home in Paris. Sophie was a victim of her gender, and her limited access to science meant she was denied the opportunity to gain a more formal education in mathematics (she was criticized in her day for the lack of rigor in her mathematical proposals) and to publish her results before many others did so –in several cases using her ideas. 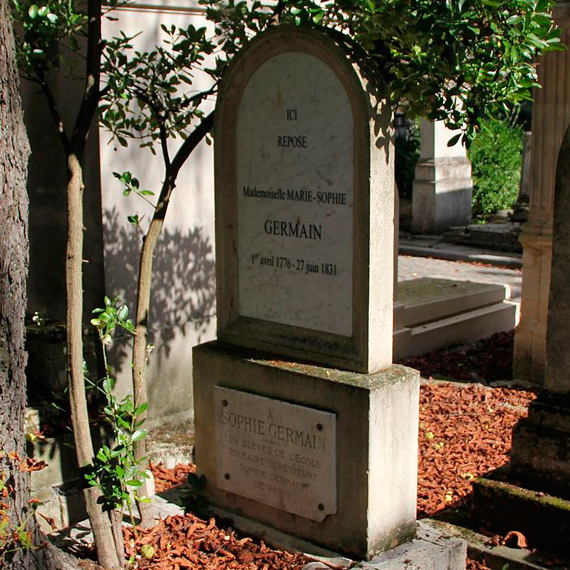 Sophie Germain was a woman who not only made a name for herself in mathematics. She also wrote philosophical works that were well received by philosophers such as Auguste Comte. However, her treatises were not always accepted for the same underlying reason: the fact she was a woman. Today, Sophie Germain holds a prime place in the pantheon of great mathematicians in history. You can read the original text in the blog “Matemáticas y sus fronteras” by Fundación madri+d. What Can a Philosopher Do for your Team? Zealandia: What is the Interest of Having a New Continent?